Teacher "desks" often become teacher "offices" which take up a good chunk of the classroom. If you are short on space, you may want to consider doing away with the desk completely. What do I use my desk for? If it's storage, think about other places that you could store those same materials (or better yet, declutter the space and get rid of some of them). If you use your desk for planning, grading, etc. then consider alternative spaces that would work better. Am I the only one benefiting from the space? Teacher desks frequently monopolize a large fraction of the classroom, yet only one person is getting use out of it. How does this piece of furniture effect my teaching? Most teachers report that they don't spend much time at their desk. When children are present, teachers should be working with them and not sitting alone at a desk. When they are out of the room there are tables available to work at. Just some food for thought. How does your desk area usually look and how does that make you feel? The desk is a direct reflection of you. If it is cluttered and messy then that sends a message to the kids. Is getting rid of the desk an option? If not, how could it be repurposed? I currently have a teacher desk in my classroom. I doubt it could be removed because I don't think there would be anywhere to store it. However, I am planning to repurpose it as an area that kids can work at. It's higher than the tables so it'll be a good option for those friends that like to stand and work. A clean workspace will improve efficiency. It will present an organized, professional image. Having systems to maintain your space daily helps protect confidential data and student information. It will make you more relaxed and less stressed. It’s very easy to accumulate a lot of unnecessary “stuff” in and around a desk. Start by determining what you really need and what you can remove from the classroom. And remember, the more you get rid of the less you’ll need to organize. Gather 2 small sorting containers (labeled keep and donate), a recycling bin, and a trash can. 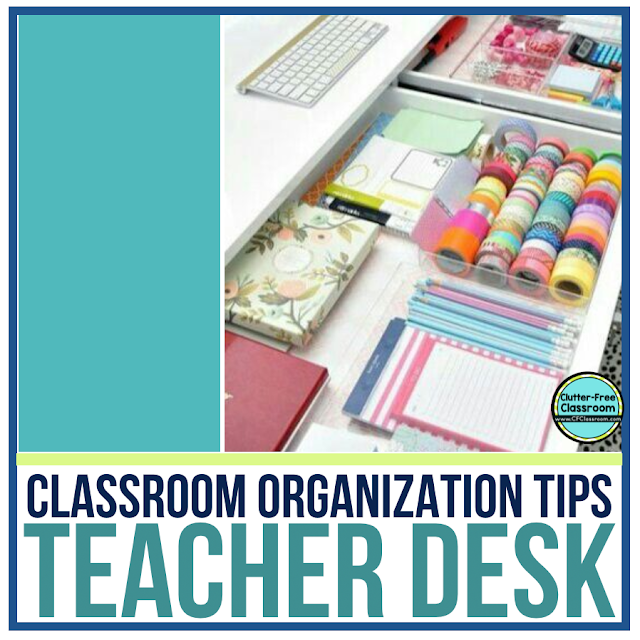 Place the sorting containers on top of your desk. Open one drawer at a time, remove the items and place them into the appropriate container. Now go through the container of items you plan to keep, sort and reconsider the items. 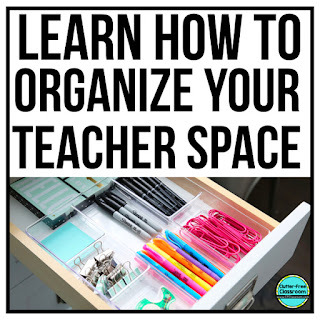 Place like items together (pens/pencils, stickers/stamps, paperclips/binder clips, etc). Get rid of anything that is considered excess. You don’t need three scissors or four bottles of whiteout. If you have a teacher supply closet at your school simply place the excess staples, paperclips, etc back in there. It’ll be there when you need it. If you can’t stand to part with it then consider getting a small storage box and placing all of the duplicate and overstocked items inside so that your actual workspace is simplified. After you have removed everything from your desk, give it a deep cleaning. Add in organizational systems for sorting objects with labels before returning items to it. Designate a space for things that come and go with you each day so they are not left out on your desktop (i.e. cell phone, camera, keys). Try putting everything you need into a box next to your desk for a week or two. When you take an item out to use place it inside your desk. Reevaluate the items that are still in the box and weren’t used at the end of the designated time period. Do you really need them? Avoid the BIG desk calendar. Those giant calendars that cover the surface of a desk look like a good idea, but can be problematic for several reasons. Desk calendars are large and awkward. The items placed on top need to be removed or shuffled to access it, and those items don’t always find their way back to the correct home. A much better solution is a small planner that is portable and easy to use. If you prefer to view the year or month at a glance, consider creating a display next to your desk that you can see, but not bury. Only put items you actually need in the teacher desk. Most likely you will never find yourself in a situation that requires you to immediately put your hands onto 24 pens, 13 boxes of paperclips, and 43 elastics. Use smaller, marked containers to house the surplus of these items and keep only a few handy in your desk. Use small boxes, or drawer organizers, to contain small items in your desk. This will keep your desk not only looking tidy, but will make it easy to find and put away objects that would otherwise be tossed loosely inside. Label the areas within your desk. A label greatly improves your chances of returning items to the correct location. It also prevents you from placing items into spots where they do not belong. Create a bulletin board next to your desk. You can either invest in a cork board or simply cover the existing wall with paper and border. Use it to display important items like schedules, lunch menus, procedures, etc. If an item is confidential (for example: student addresses and phone numbers), create a “pocket” to hide the information, but still keep it at your fingertips. A file folder works well for this. Use stacking trays or a vertical wall system for separating items. Some great categories include: to do (things that need to be addressed, filled out or copied), to file (papers that need filing), and “to read” (items that need your full attention). Also consider the trash can to be your fourth and most important filing category. Create a home for your plan book. Always keep it in the same place when you are not writing in it. Inform a close colleague about where you keep your plan book and teacher manuals, so that in the event of an unplanned absence everything will be accessible. Store small items into your desk. This includes paperclips, pens, erasers, and such. Desktop organizers seem like a good idea, but add visual clutter and take up valuable space. They also make it too easy for children to access them. Clean off your desktop often. Get in the habit of always cleaning off your desktop before lunch and before you go home. This will ensure that you don’t reach the point of being overwhelmed by the task. 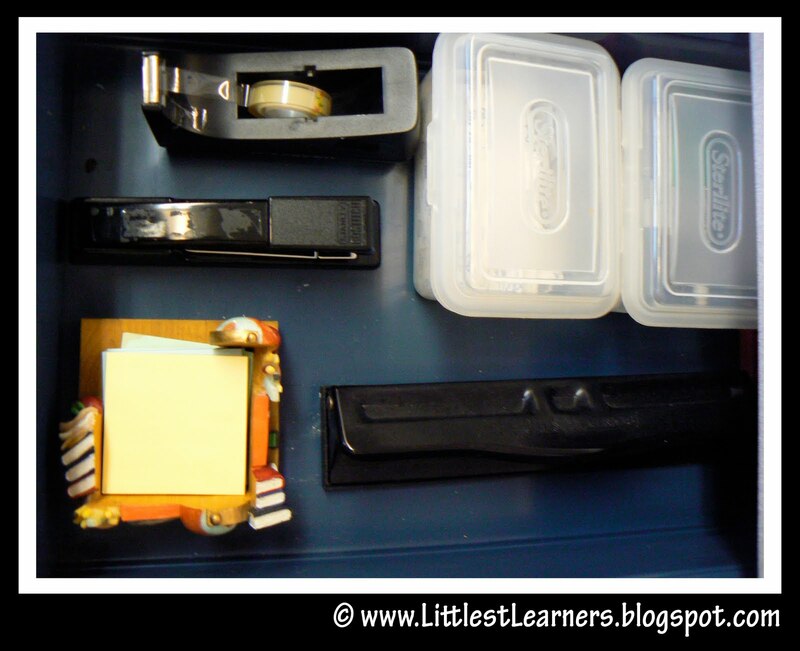 Take the items that are typically found on a teacher's desktop and relocate them to a drawer. They'll still be easy to access, but won't be cluttering the area. This includes things like post-its, a stapler, tape, etc. Use small containers within the drawer to keep things organized. Labeling the baskets is helpful too. There are some great desk organizer products available, but I prefer to keep everything out of sight. Always be ready for a substitute. Strive to leave a clean workspace with emergency sub plans out and visible when you leave each day. Not only will you feel more productive coming into a clean spot, but you will never need to worry about sub plans again. 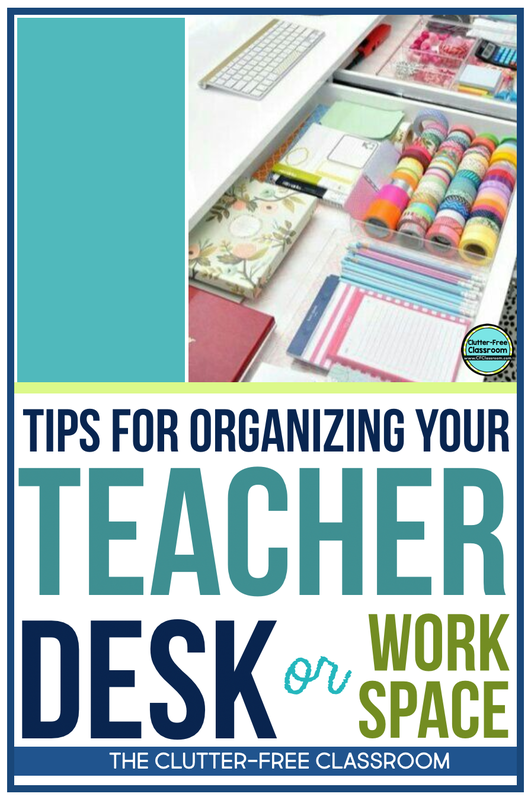 Once your desk is organized, develop routines to make it easy to stay that way. Get into the habit of always clearing off your desktop at the end of prep, before lunch and before you leave for the day. Stop using Sticky Notes for reminders. Instead keep one notebook designated for reminders and to do lists. I love me a Post-It too, but they make your work area look cluttered. Limit the family photos and kid art. It’s nice to have pictures of your family available so that your students can connect with you and know you are human. It’s also great to be able to look at the smiling faces or your loved ones while you are away from them. However, your classroom should not be a shrine to your family. Consider creating a personalized binder cover insert or a page protector with your personal photos. You could also go digital and simply look at your phone when you want to see those adorable little smiles. Say no to knick-knacks. Enough said. Schedule times to clean your desk. Make this a routine. My class takes a few minutes to wash their hands and gather their recess things just before lunch. They also take about five minutes to pack up to go home at dismissal. I use both of those times to “manage” my desk. I quickly recycle anything I don’t need, address things in my action file, and relocate anything that has been placed onto the surface. Because it never gets to the “out of control” stage, I am able to tend to it during these two short periods of time. After the kids leave for the day I wipe the desk down and place my emergency sub binder in the center of the desk. Stick to one pen. Pick a brand and color that you like and use it exclusively. Only keep 2-3 on hand at a time. Don’t print emails or resources unless you absolutely need to. Use twist-ties to tame cords. Keep a clear desktop. You’ll be amazed at how this makes you feel psychologically. To achieve this goal store things in the drawers, attach photos to the desk or on a nearby wall. 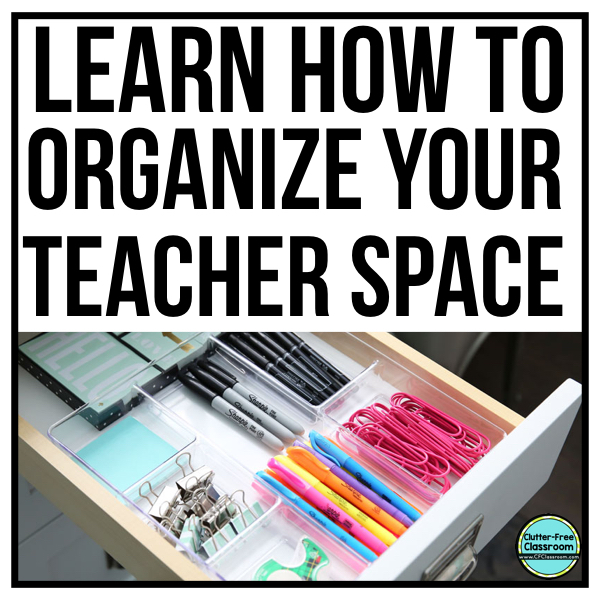 Consider creating a “traveling office” by placing a pair of scissors, a stapler, a roll of tape, a couple pens and some paperclips into a portable tote that can be stored on a shelf, under a table or in a cupboard when not in use. 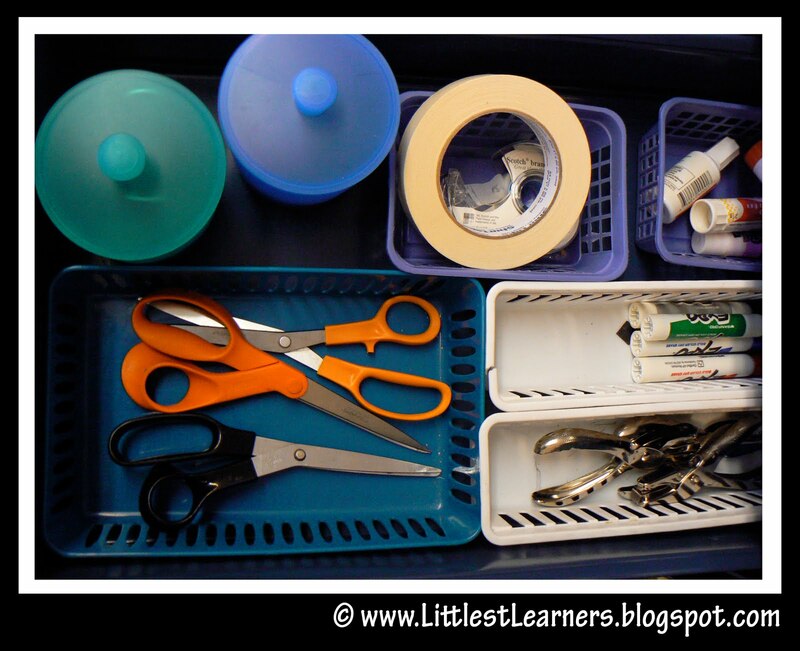 Create smaller containers and spaces to store items within drawers. Use small boxes, plastic containers, muffin tins or draw sorters to keep things organized. Go the extra step by labeling each section. It greatly increases the odds that you’ll put things back into their proper place. Find a method of managing cords that works well for you. You can use zip ties to tighten them and/or a basket to corral them. You could also cut holes in a box to keep the cords together while in use. Attach a label near the power source to identify the purpose of the cord. Do not use your workspace as a closet. Designate a closet or drawer to house your purse, coat, lunchbag, etc during the workday. Don't hang your coat on the back of your chair. Establish routines for maintaining a clutter-free, clean workspace. Keep a container of baby wipes in your newly decluttered drawer. Get in the habit of clearing the surface throughout the day and wiping it down before you go home. Keep your keyboard clean. Use the sticky end of a Post-It note to clean between the keys on your keyboard. Avoid eating at your desk. It will invite mess. Plus, you need a real break during the day. Have a designated space for notes and a method for organizing your Post-Its to avoid little scraps of paper here, there and everywhere. Avoid a generic “inbox tray.” Invest in a filing system. Create sections for managing papers (i.e. need response, to be copied, to be corrected, to be filled out, etc). This will keep things current and allow you to have less piles to shuffle. Go paperless as much as possible. Use your iPhone for notes, calendar, etc. Keep a paper shredder and a trash can within close proximity to your work area to make it easier to purge as needed. Designate one day a month for a deep desk cleaning. Get rid of anything you’ve acquired recently that you don’t need along with items you may have initially saved.